"Writing for me is a way to process what is buzzing around in my head. When I put my thoughts on paper, I begin to see things more clearly." Hurtling down Sugarloaf's famed Narrow Gauge Trail, ski racer Sam Morse drops 2,430 vertical feet in a little over a minute. The 16-year-old, 200-pounder reaches speeds in excess of 60 mph on the mile-and-a-half-long World Cup downhill course. Sam's parents, coaches, and teammates support his pursuit of podium gold . . . so does his writing. Since the age of seven, Sam has kept track of his skiing in an ever-evolving series of athlete's journals. Caruso submits that writing in journals is a "proven way for athletes to set and revise goals, assess their progress, ask themselves important questions, and thereby open up their inner wisdom" (Caruso 2004, 9). Athletes from middle school to the professional ranks use various forms of writing as a way to learn in sports (Kent 2012a). They write in journals, training logs, and team notebooks as well as in blogs, social media, and email. Sometimes they write on their own; other times writing is assigned by a coach or sport psychologist. Used by Olympians and high school athletes alike, "the athlete's journal is a versatile tool that aids every area of sports psychology and general athletic performance" (Caruso 2004, 8). The wide array of journal keepers includes such greats as swimming phenom Michael Phelps (Stump 2012), baseball all-star Carlos Delgado (Jenkins2006), and tennis champion Serena Williams ("Serena…" 2007). Athletes' journals come in a variety of forms and provide athletes with writing that can afford them "a place to set goals, reflect, grapple with issues, keep track of training ideas, and record results as well as plan, scheme, ponder, rant, question, draw, and rejoice" (Kent 2012a, 105). –Athlete's Journal/Open-Ended: athletes write whatever is uppermost in their minds within the blank pages of a notebook. –Athlete's Journal/Prompts: athletes write in response to prescribed writing prompts about training, competition, and everyday life. 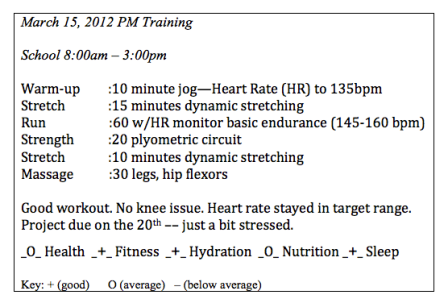 –Athlete's Journal/Training Log: athletes combine their training log and journal writing to list what happened during their day and include training activities, training hours, and competition results among other pursuits (Figure 1). –Athlete's Journal/Team Notebook: athletes write to prompts in a workbook supplied by their coaches and focused on a variety of areas including preseason, competitions, training, school or work, injury, and life beyond sport (Figure 2). My strengths as a player in today's match: Maintained defense's compactness. Right amount of talk - I didn't talk to much like at Lisbon. I had a brilliant run through the midfield into the attacking third....? My weaknesses as a player in today's match: I could have been more supportive of Jason. When I encourage him he plays better. Team strengths in today's match: We worked as a team - great support - positive comments...Good halftime adjustments. Team weaknesses in today's match: We could have been more inventive in attack during the 2nd half. We used Matt too much. Opponent's strengths: They never let down. #9 had warp-speed. His runs opened space and chances on goal. Opponent's weaknesses: Their midfielders and forwards did not mark us well in attack. What was the "difference" in today's match: Our midfielders support of the forwards...and, did I mention, a brilliant run by the sweeper? What team adjustment would you suggest for the next match against this opponent? #9=FAST. Move Dusty? More variety in attack. Other comments about team strategy, attitude, preparation.... We were prepared! The seniors had us ready to play. Un-DE-feated! Writing organizes and clarifies our thoughts. Writing is how we think our way into a subject and make it our own. Writing enables us to find out what we know — and what we don’t know — about whatever we’re trying to learn (1988, 16). Whether a writer is a microbiologist, an art historian, or even a 16-year-old ski racer like Sam Morse, putting thoughts on the page helps writers think, explore, and discover. The most common writing in journals is expressive writing, which assists writers in discovering and clarifying ideas or experiences for themselves or for others (Britton 1975; Martin 1983; Newkirk 2009). Martin describes expressive writing as "crucial for trying out and coming to terms with new ideas." Similarly, Hudson and Day indicate that expressive writing helps "prepare athletes for negative emotions and emotional transitions." Their work concludes that "expressive writing helped athletes to confront, reevaluate and change perspective on their stressor, solve problems, manage emotion, experience self development and, practice a preparation strategy" (Hudson and Day 2012, 805). Ultimately, when athletes write in their journals, they have an opportunity to explore their own thinking on their own terms. For Sam Morse, writing augments his competitive life. He began keeping journals at age seven when family road trips during the ski season took him out of his elementary school for a chunk of the winter semester. Through the past nine years of his ski-racing career, Sam has continued keeping journals. At Carrabassett Valley Academy, an elite and selective ski and snowboard school in Maine, Sam's coach, Chip Cochrane, describes Sam as "dedicated . . . hardworking and smart, an intelligent guy" (Cochrane 2012). English teacher Mary Poulin speaks about Sam's "extreme journaling, adding, "The practice has assisted him on the [ski] hill, in the classroom, and on paper. He has developed into a fine writer with a level of commitment that any writer would find enviable" (Poulin 2012). Sam's journals offer a look into the writing of a focused athlete who happens to be one of America’s top 16-year-old alpine ski racers, having competed at the 2012 US Junior National Championships and in the 2014 FIS World Junior Alpine Championships in Slovakia. Tuesday 2/22 We didn't ski, we worked out, medicine ball routine and 20 minutes of spinning then a super set workout, I couldn't do everything because my thumb was opening back up. Also within his 2011-2012 training log binder, Sam collected artifacts of the year that reflected his training, races, work, and personal experiences, including brochures from a tour of Harvard University, email exchanges, school and work schedules, Red Sox ticket stubs, and an In and Out Burger hat from a ski-racing trip to California. During a radio interview about athletes and their writing, Sam emphasized the value writing provided him as an athlete. "It's definitely a time of reflection," he explained, "seeing what I did wrong and what I did right in terms of skill and technique" (Morse 2012b). Although Sam's open-ended entries did not feature significant reflection, evidence of planning, analysis, and evaluation surfaced when he responded to writing prompts. Writing for me is a way to process what is buzzing around in my head. When I put my thoughts on paper I begin to see things more clearly. Lately I have been writing a lot about ski technique and how I feel each day when I try new things in training. This process of writing down what I am experiencing has some times opened new doors in my mind of the way to do something. When I say 'something,' I am talking about the nit and gritty of ski racing technique and tactics. Recently over the past few months I have written a lot about the development of the top of the turn, I have been looking back at my writing and trying to use the things that work to try to make myself a faster ski racer (Morse 2012a). This prompt channeled Sam’s writing and reflection and guided him to explore his thinking. As a result, he examined his ski technique, thought about tactics, and worked to revise his practice. Writing provides athletes ample and authentic opportunities both to reflect on their experiences and to learn from them. Whether making sense of a last-second loss or gearing up for a long summer of training, writing has the potential to guide athletes in surveying their emotions, coping with challenges, designing new approaches, and adapting to the ups and downs of sport. In Sam's journals, evidence of organization, reflection, and decision-making emerge. In nine years of writing, this athlete has recorded the races he skied, the hours he trained, and the places he traveled. To page through these journals is to discover the life of a serious athlete as he lists, explores, and makes meaning of his time on the ski slopes, in the classroom, and throughout his every-day life. At the same time in his journal writing, Sam accomplishes a good deal of what Burton and Raedeke call "mental muscle work" that some argue could help athletes with "creating and maintaining a flow mind-set, enhancing performance quality, increasing performance consistency, and handling failure and adversity" (Jackson and Csikszentmihalyi 1999, 255). Similarly, Sam's writing could also be used to the advantage of his coaches as a way to expand conversations about training sessions, competitions, and daily life beyond the ski slopes. Coaches see themselves reflected in their athlete's writing and find ways to revise their own professional coaching practices (Kent 2012a). Such work could take place in one-on-one sessions with a coach or in small group work with other athletes and coaching staff members. Finally, in a more traditional school setting, Sam's teachers could utilize properties of his writing to connect to history (e.g., written and oral traditions), science (e.g., the physics and biology of a ski racer's life), and English/Language Arts. When asked if his sports journaling connected to his school writing, Sam said, "Most definitely… I'm not sure I completely made that connection until I started talking to my English teacher … but now that I've really thought about it some more, I definitely am seeing the connection of how my journaling has helped grow a passion for writing inside of me… trying to put ideas on paper … I definitely think my journaling has helped my writing skills" (Morse 2012b). While explaining the different ways journal writing may have helped him as a student and as an athlete, Sam said, "Over the years I’ve accrued all of this data — it’s a really great measure of progress" (Morse 2012a). If these journals serve solely as a data set for measuring growth, the writing would provide useful feedback for a variety of athletes. But these entries capture more than a collection of work and accomplishments; they serve to instruct, motivate, and guide athletes like Sam to continue working toward the elusive next level in sport. For Sam, in 2014, that meant winning the silver medal for the U.S. Ski Team at the Alpine Junior World Ski Championships in Jansa, Slovakia. Caruso, Andrew. 2004. Sports Psychology Basics. Spring City, PA: Reedswain. interview of ski coach Chip Cochrane. Writing toward podium gold, November 23, 2012.
about sports stressors." Psychology of Sport and Exercise 13, no. 6: 798-806. Experiences and Performances. Champaign, IL: Human Kinetics. Jenkins, Lee. May 4, 2006. "The Diary of Carlos Delgado." New York Times. to Advance Learning and Performance in Sports. New York, NY: Peter Lang. 52, no 2: 28, 30-31. Morse, Sam D. March 30, 2012a. Interview by R Kent [personal interview]. Interview of Sam Morse. Orono, Maine. Morse, Sam D. 2012b. Writing on the Bus [Web series episode]. Berkeley, CA. Principles Worth Fighting For. Portsmouth NH: Heinemann. Poulin, Mary. November 29, 2012. [Personal Interview]. An interview with teacher Mary Poulin. Writing toward podium gold. Zinsser, William. 1998. Writing to Learn. New York, NY: Harper & Row. Richard Kent is a professor at the University of Maine and director emeritus of the Maine Writing Project, a site of the National Writing Project. Kent may be reached through his resource website http://www.WritingAthletes.com.